I hope everyone had a safe and relaxing weekend. My daughter needed me to help her come up with some easy to make ornaments for a shower she is throwing. We found fun ideas on Pinterest - and then just changed them up a little. My favorite one we made was this 3D ornament. You can see that the backgrounds are both Spellbinders Pinking Circle Dies. The letters are cut from the brand new Blocked Alphabet Die Collection from PaperTrey Ink. Then we Stickled them in bright red. After adding just a little snow (Tinsel Glitter from Martha Stewart), we glued half of a plastic ornament on top to encase it. This was such a fun and quick project but I think it really packs a punch. We put together kits for the gals with lots of other words and some images too that I cut with my Slice. We kept everything white, green and red and then added sparkle with pearls and rhinestones. SUPER FUN! Just for fun I decided to link this to the Hand Stamped Sentiments weekly challenge. You can see all of the projects right here. 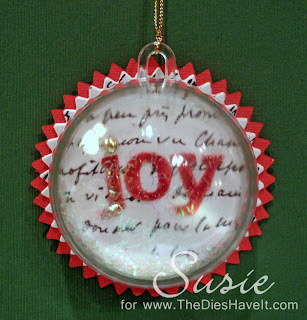 I've also been busy doing Tim Holtz' Twelve Tags of Christmas. It is my 5th year, so I'll have 60 tags when I finish this batch. Tomorrow I am going to show you my Day Three Tag. I didn't like the one Tim did, so I went totally off script and created one that I like much more. I've done that a few times over the years, but mostly I replicate what he creates. He is one talented man!! So come on back tomorrow for a little glimpse into my tag creation. and you are one talented lady!! Love your 3-D ornament and I'm a total Pinterest addict too! :) Thanks for playing along this week at Hand Stamped Sentiments! What a fun idea for a shower. Very festive and oh...pinterest....dangerous! LOL! :) I like the fuzzy letters and all of the sparkle. Thank you for joining us at Hand Stamped Sentiments. This is such a great idea! Never thought to use just half the ornament!!! Thanks so much for playing with us at Hand Stamped sentiments this week! Can't wait to see you back again! Another very clever little idea! I love pintrest! And I love the snow here in your ornament! Thanks for playing at Hand Stamped Sentiments! What a cute idea! Such a simple but WOW idea. Thanks for playing with us this week at Hand Stamped Sentiments. What a cute ornament! I love the idea and how awesome to make them for a shower-So FUN!